Actress Marsai Martin is well on her way to becoming a Hollywood mogul and she’s only 14. Martin has executive produced her first film, “Little,” which arrives in theaters nationwide Friday. 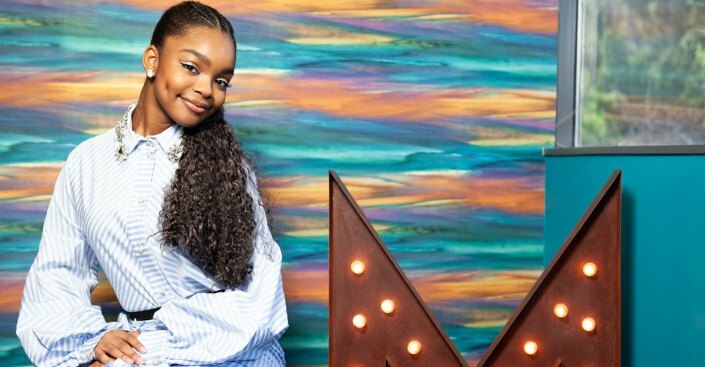 You might have heard the story by now: That Marsai Martin pitched "Little," a modern spin on "Big," to Universal Pictures at age 10. It's true, she did, but that precocious move was preceded by another, more impressive act of rebellion and a pivotal moment in putting her on the path to becoming the youngest executive producer ever: She fired her agents after the first year of "black-ish." The ABC show, in which she plays the Johnson's whip-smart daughter, Diane, was on its first hiatus and Martin and her family wanted to know what opportunities there were. "They were like, 'You should just stick to "black-ish," just chill, take a break,'" Martin said. Besides, the agents explained, there weren't any roles for a young black girl out there. But the Martins persisted and suggested creating something themselves. "They kind of just laughed at us. They didn't see the vision. But I think they didn't see it because they saw what I looked like: A little black girl that no one would want to see," Martin said. "So, we fired them." Four years later, it's almost ancient history for the now 14-year-old sitting in the conference room of Genuis Productions, the company she founded, as she prepares for "Little" to hit theaters nationwide Friday. The office space is a projection of Martin herself, with accent walls in her favorite color blue, her and her baby sister's preferred snacks in the break area (Goldfish crackers, rice crispy treats, etc) and a PS4 in the lobby (as well as her NAACP Image Awards). Her own office is well on its way to having the Alice in Wonderland-feel she wants with "grand plants" and colorful throw pillows. There's also a very teen-appropriate Polaroid wall, and a perfect view of the Universal sign out the window. "It's a creative spot for me and a place where I can express how I feel and just get my mind in a cool place where I can just come up with anything I want," Martin said. "I'm very grateful and doing it with my family is even better." After the break with the agents, "black-ish" creator Kenya Barris helped nudge Martin in the right direction, securing a meeting with his friend, producer Will Packer, who's been behind such high-profile hits as "Girls Trip" and "Night School," to hear her idea. "I didn't expect much, because, you know, I hear a lot of pitches and most of them aren't great. I said 'Listen, I'm sure she's sweet. I'll do it as a courtesy,'" Packer said. "And she comes in and she's got this fully thought out, really coherent, cohesive narrative, with characters and themes. I was like, 'She's how old again?'" Her story would be about bullying and female empowerment. "We wanted it to be as authentic as possible... even though it's a fantasy, body-swap film," Martin laughed. She stars as the young Jordan Sanders, a science-obsessed teen who is bullied so much in high school that she grows up to be an insufferable bully herself, as the head of a major tech company. The adult version of Jordan is played by Regina Hall, who Martin had worked with on "black-ish." Rounding out the cast is "Insecure's" Issa Rae ("a creator like me"), as Jordan's undervalued assistant. Martin loved the whole development process and is glad that it took a few years for filming to start, allowing her to mature a little bit into who she is today. And then, this past February, something even bigger came along: Martin got a first-look deal with Universal, too. "It was so exciting, but to be honest, I didn't even know what it meant at the beginning," Martin said. "I was like, 'Oh cool! What is that? Like, OK, this seems very professional. Am I in it now? Like is this some Jordan Peele-type stuff?'" When she realized that it meant the studio gets first dibs on anything she creates, she was thrilled. "I was like, 'Oh, OK! So I can create whatever I want?' I thought that was so cool because this mind has a lot of things," she said. "I can keep creating things that people don't get to see often." She knows it's unusual to be wielding this much creative power in Hollywood at this young age, but she also enjoys catching people off guard. "It's like, 'Oh, snap, THIS girl, created this film?' And it's kind of shocking," she laughed. Her life is pretty crazy right now promoting "Little" and developing new films and television projects. She's home-schooled with a tutor, which she prefers, and she doesn't have any regrets about missing out on the high school experience. "I used to be the shy kid who would barely raise her hand or speak her mind," she said. Even now she suffers her own share of self-consciousness. "That's something that I have to work on: Self-confidence and loving myself," she said. "Your girl gets a lot of anxiety. It's OK. It's a learning process. I feel like a lot of kids my age get it, whether they're in the industry or not." When she does have a moment to unwind, she plays "gruesome" video games like "Mortal Combat," gets facials, massages, cooks and sometimes just watches YouTube. But even then her wheels are spinning about possible collaborations with her favorite YouTubers. Down the line, she wants to direct and write and, basically, do all the things. Packer, for one, is convinced she will. "She's got a long, strong career ahead of her. And if she chooses to continue in movies and television, you better watch out because she's going to make a serious mark," Packer said. "But she'll make a mark wherever she ends up."